Every year, the school organises an educational trips for students. From class IV onwards, the students undertake tours with teachers. While Delhi/Agra and Bikaner are the preferred travel destinations for classes IV and V every year, the list of travel destinations for classes VI-XII is extended to include scenic places across India where students can enjoy adventure sports. The popular destinations where the students have indulged in adventure-filled sports are Nag Tibba, Chakrata, Dodital, Chopta, Kempty Falls, Shimla, Gir National Park and Jim Corbett National Park. The tours prove to be a team-building exercise. Their importance is further intensified due to the environment for learning they provide outside classrooms and development of non-academic skills in students. These tours also present an opportunity for formation of new bonds and strengthening of the existing ones. 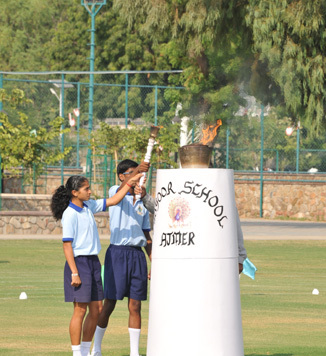 We encourage the students to be a part of fun-filled school tours. Once the travel destination for the year is decided, the students are informed about the tour details including the charges. Once a student takes consent from the parents, travel itinerary is given to him/her. Henceforth begin the preparations for collection of memories that will be cherished for a lifetime.